I am an Assistant Professor with IST, Department of Electrical and Computer Engineering , Universidade Técnica de Lisboa. I am also a researcher at the Speech Processing Group of INESC. 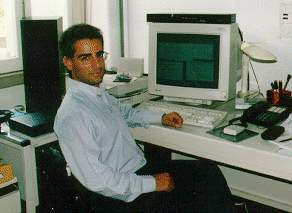 In the school year of 1999/2000 I am teaching Signal Processing to undergraduates of the 3rd year of Licenciatura em Engenharia Electrotécnica e de Computadores and Licenciatura em Engenharia Aeroespacial . Text-to-Speech synthesis for the Portuguese Language. Methods for automated voice source analysis. Integration of speech processing technology in the national information service of Portugal Telecom. Development of a text-to-speech system for european portuguese. Our synthesizer currently runs on Unix machines (SunOS, Linux, etc.) and on PC's running Windows95. development of the DIXI system for Alternative and Augmentative Communication. Aquisition of a 4000 speaker database for voice-driven teleservices. You can look at a sample of the portuguese database. If your computer is capable of playing audio files you can listen to some demos of our work. Sample recordings of the Portuguese Database. Speech synthesizer for telephone numbers. Available in postscript ou em PDF, the table includes the phonetic symbols in IPA format, in the PT-SAM ASCII representation, the grapheme associated with each phoneme and a sample word.